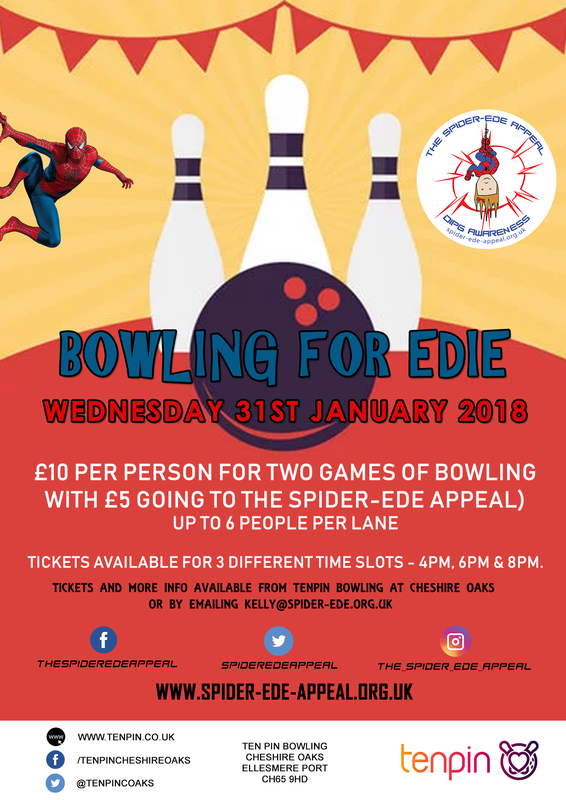 On Wednesday 31, January Ten Pin at Cheshire Oaks will be raising funds for the Spider-Ede appeal with a Superhero Bowling Party (fancy dress is optional, but encouraged). Tickets will be available at £10 per person for two games of bowling, with £5 going to the appeal fund, with a choice of three different time slots – 4pm, 6pm & 8pm. Upto six people per lane are allowed to play. Wednesday, January 31, 2018; 4pm-10pm (3x 2 hour time slots available). To book a lane please either contact the Ten Pin Cheshire Oaks directly or email kelly@spider-ede.org.uk.